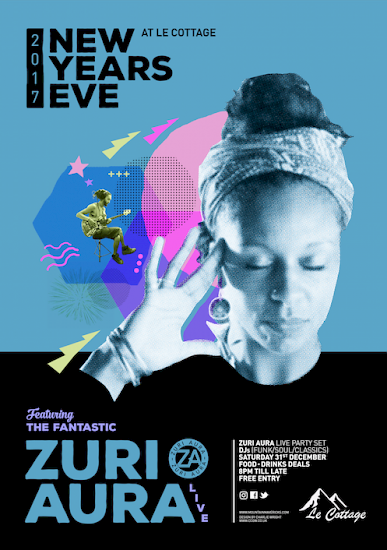 New Years Eve with Zuri Aura in Morzine. Hotel Le Cottage. We first brought Zuri Aura to Morzine for their first set in December 2014 and they loved it so much that they decided to stay for the remainder of the season providing the most crazy parties for all types of holiday makers, seasonaires and locals. Last season the town only got a small dose of Zuri Aura music, but we’re happy to announce that Zuri Aura will be playing at Le Cottage for New Years Eve, and we couldn’t think of a more suiting way to bring the bells in! Le Cottage will also have Funk & Soul DJs bringing some great party vibes when Zuri Aura aren’t on stage, and we will have some tasty drinks deals; including ‘The Zuri Aura Smokescreen Punch’, which is named after their first Mountain Mavericks Session filmed at the Lac Mines d’Or in Morzine in 2015. Our friends from Planks Clothing (who have just opened a new store on the high street of Morzine) will be supporting this New Years Eve event and lucky party goers may get some free stash throughout the evening. The party is completely FREE ENTRY and starts from 7.30pm until late. We will have food options available and it’s also the closest place to see the Pleney Fireworks, as no New Year is complete without fireworks! We still have a few beds available at Le Cottage over New Year and we have a mega New Year Deal to celebrate Zuri Aura joining the party! Contact us quoting ‘New Year in Paradise’ to make the most of this party deal! Bring it on 2017 – we’re ready for you! Next: Pre Season Snowfall. What it looks like in the Alps!